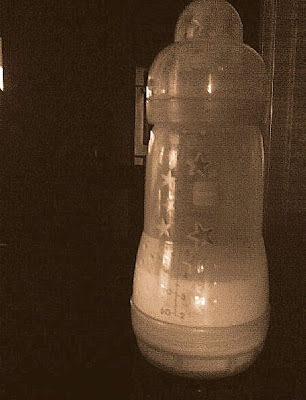 Yvonne's parenting journey, wellness and tips, photography blog: Is your baby don't like to drink milk? Is your baby don't like to drink milk? Since the time I stop breast feeding.. marcus dont like to drink milk... even is breast milk in the bottle or sippy cup.. at last we able to find the solution that he will drink milk after he just fall asleep.. at the first 1 month or so.. he is doing good.. at least drink around 20-28oz per day which each time he can drink 6-7oz easily... but recently he cut down only sleep 3 times a day.. so he only drink 3 times a day around 3-5oz maximum... his nutrition requirement is at least 16oz per day.. but at most he only drink around 12oz average daily..
We tried sippy cup.. straw cup.. all doesn't work.. he is too smart.. if we put juice in the cup.. then he will at least drink some of it.. if he taste is water.. he will take a sip... if he taste is milk.. he will throw away immediately.. I am really stress up sometimes.. stress until i feel like biting someone.... u know what is "geramnya" when he refuse to drink milk and eat.. my temper become very bad..
when he is still small baby times.. i think it is much easier on taking care them.. as they are more "controllable" but as they grow bigger like now.. he has his own "will" and his own "like and dislike" which he become a "uncontrollable" anymore..
after sometimes now, I learn to be let it be.. and let them be.. a few of my friends' babies are also the same.. and this is what they told me "no worry la!!! they just eat and drink lesser.. they will still grow up.. just maybe thinner than other kids only!!" But, sometimes I will still be very geram.. I think this is natural... the feeling inside this geram i think consist of "worry.. sad.. love.. angry.. helpless.. and more"
I really hope one day marcus will drink his milk when he is awake..
be a parent.. be a mother.. what I hope is he grow up well.. eat and sleep and poo well... this is just fundamental.. am I asking too much?? p/s: pic taken with my blackberry mobile phone..
Hi Yvonne...I can fully understand your feeling of 'geramnya' n I also always asking myself the same question of "am i asking too much?" Your wish is perfectly normal, just like other parents. My boy doesn't like milk on its own. Usually I serve with oats, small pieces of his favourite bread or o-shaped cereal, spoon-fed from a bowl. He'd be more interested. Do you warm up breastmilk? How about offering cold breastmilk from fridge? Many babies love it! Contrary to what many people think, my boy never got a tummy ache drinking cold fresh milk every day; it's just like adults. Does Marcus like yoghurt? Every week, I make Easiyo organic yoghurt and serve with oats, o-shaped cereal or fruits (these few days, blueberries, he loves it!). This makes up about 1 cup. Wai Fun.. yeah loh.. take care baby is really not a easy job!!! MieVee: Anything with milk he seem not really like it.. yes.. I also made esiyo yoguty for him snd he is eating it well.. but I found that coz the fluid intake is lesser and resulting har stool.. which is another problems too..
i believe he is taking solid food now. You can find from the book that baby at this stage, the nutrient is mostly from the food not so much on milk.